With Sue and Diesy heading off after their second full week of looking after me, I was truly in their debt….well maybe not so much Diesy’s debt. He had a great week with miles of great walks, plenty of canine friends to sniff and more than a few bonus treats. So for a genuine change, I had quite a relaxing day as Kate was already on board and took over mothering me by doing many of the chores I had become accustomed to doing myself on changeover days. It even gave us time to nip into Filey for the evening and treat ourselves to a chinese and a good one at that. With another heavy dew accompanied by a low hanging mist it was down to Hummanby Sands for a brief and chilly beach stroll before dipping inland to follow the only accessible OS marked route across farmland for the villages of Reighton and Speeton. The long grass liberally soaked my lower legs and feet and my first steps through the cobwebs draped silk around my walking pole and calves like fine flowing tassels. 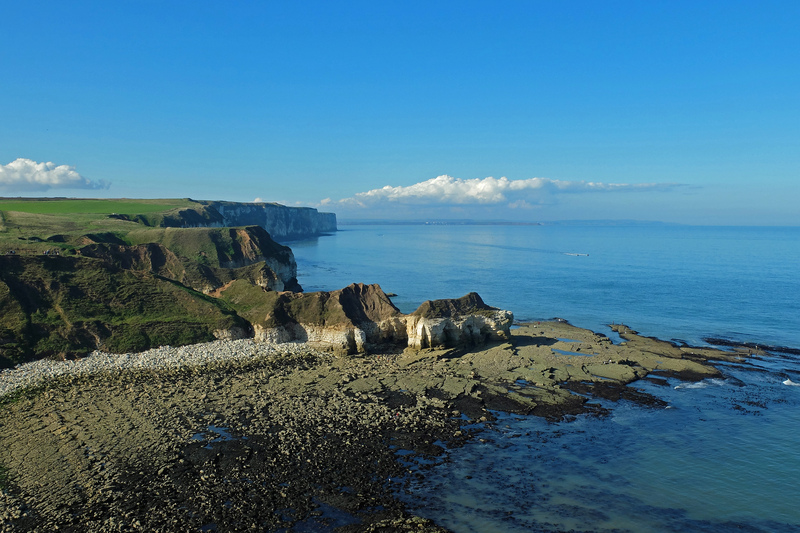 The sun quickly burnt the early mist away as I made my way back to the coast joining the Headland Way and a walk across the top of Bempton Cliffs, reportedly home to the largest colony of gannets on the UK mainland. Twitchers and walkers now outnumbered the birds and only increased in number as I approached Flamborough Head which added Sunday strollers and anglers to the bright Sunday afternoon throng. The sheer number of anglers was a surprise and they gathered in droves on the rocks and in small inshore boats all dangling a hopeful line into the water, though I didn’t see one pull anything in. I love sea fishing too, but for me the pleasure is in fishing alone and without someone commenting upon my ineptitude or taking to bait advice. I like to learn by my own mistakes. The walk along the cliff edge down into Bridlington slowly shallowed out until I was on the promenade with its diesel-powered land train, noisy fun fair and late afternoon ambling families. One overheard conversation between a young couple made me smile. “Have you ever been on the Spotty Boat in London?” he asked as they watched a power boat twisting and turning a few yards offshore. “I’ve never been to London.” she replied. “No, you’ve only ever taken me to seaside towns.” she sniped. “You’ve been to Manchester.” he snapped as a riposte. “Only to the airport.” she said with finality. I met up with Kate at the harbour and we indulged ourselves with a 99 cone, a rare treat with the season closing in. I wondered if hot pies and pasties would be more likely from here on. The wind had got up significantly overnight and the sky had a threatening murk. Nonetheless, it was dry to start and I made my way through the regiments of static caravans to rejoin the beach. 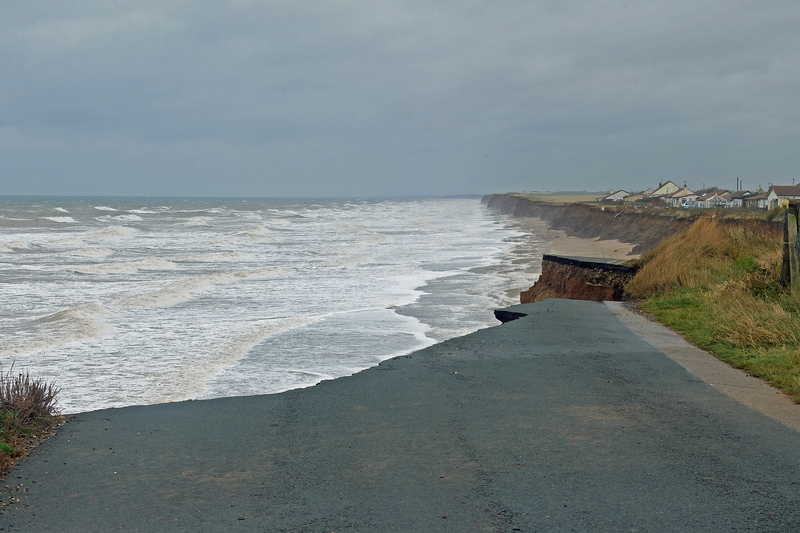 I was hoping for a personal record-breaking beach walk all the way to Aldbrough today, but the tide was only just turning to go out and it was a high spring tide. With no option, I dipped inland and crossed farmland again to round another static caravan park. By the time I returned to the cliff I was now in a land suffering from serious coastal erosion. Once a seaside road, not any more. Once a garden, now on the beach. Once a house? Some pessimistically say that they can expect to lose up to ten metres of land a year to the sea. In truth I think the figure is closer to two metres, but either way it’s still a fair chunk of land and very tough for some people who have lived on this part of the coast all of their life to see nature slowly but very surely take what they thought was theirs. They must dread each storm and high tide and another one was very imminent. I found a few homemade steps taking me down the muddy cliff and onto a mixed shingle and sand beach which looked very bleak and rarely walked. The rain finally decided to break free from the heavy clouds and washed in over my left shoulder with a gusting wind picking up speed by the minute to push me forwards at pace down the beach. It was a beach rich with pebbles and a few fossils, but it wasn’t the weather to linger. Fortunately the MOD range I had planned to divert around was open, so I stayed on the beach all the way to Aldbrough. A steep slippery climb up a muddy cliff took me to Kate waiting in Snickers and feeling decidedly sea-sick at the violent buffeting it was taking from the gale now battering in. I suspected that we might be in for a restless night so we moved Snickers to the leeward side of a building to give some shelter from the onslaught that began as the evening drew in. My suspicions were well founded as the night had brought torrential rain and a wind that I hadn’t experienced since Bertha struck back on the West of Scotland. A few of the nearby static caravans, which had temporarily been moved away from the cliff edge, had made a break for freedom but none had suffered any damage. The same couldn’t be said for the cliffs. I returned to the cliff edge for an inspection. The wind was still raging but the rain had mercifully abated and only sea spray made me keep my waterproofs on as I briefly stuck to the cliff top. There was no chance of walking back on the beach for a while as the tide was still far too high and the waves were literally washing chunks of cliff face away before my eyes. With no coast path to follow I took to farmland again and a diversion inland around the village of Grimston. As I regretfully approached a road junction I heard jogging footsteps behind and a voice called out my name. I had been emailed a few days before by Flora who had very kindly offered bed and board at her place nearby. 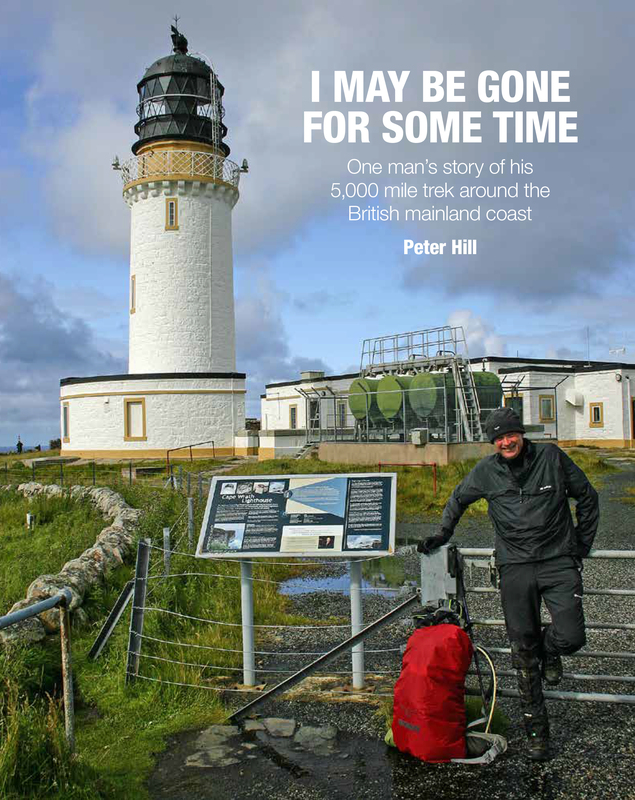 A fellow long distance walker, she had completed LEJOG last year and had through some convoluted friend of a friend method found out about my journey. She took me back up the lane and also took control of my route for a while as her local knowledge guided me through uncharted paths and private land. It also took me past her front door and that meant that a cup of tea and a Tunnock’s Tea Cake just couldn’t be refused. I had only turned down her kind offer of accommodation as we had already arranged last night’s stopover at Aldbrough, but on meeting Flora and her husband Ian, plus the heavy battering of the overnight storm, I rather wish I hadn’t. Flora walked with me back to my planned route before turning for home. I had enjoyed my brief time in Flora and Ian’s company and meetings like this have been a highlight of my trip. I think she would have liked to join me for a full day of walking and her company and easy conversation would have made a great change. It’s always nice to compare notes, experiences and geeky kit reviews. Back on the cliff top path, the wind had now eased and the tide was receding nicely. I was soon back on the shingle beach and heading towards Withernsea. For the rest of the day I was afforded the sight of coastal erosion in action as I came across muddy boulder after muddy boulder scattered across the beach. At one point a small cliff collapse and landslide came to halt barely a few steps away from me. 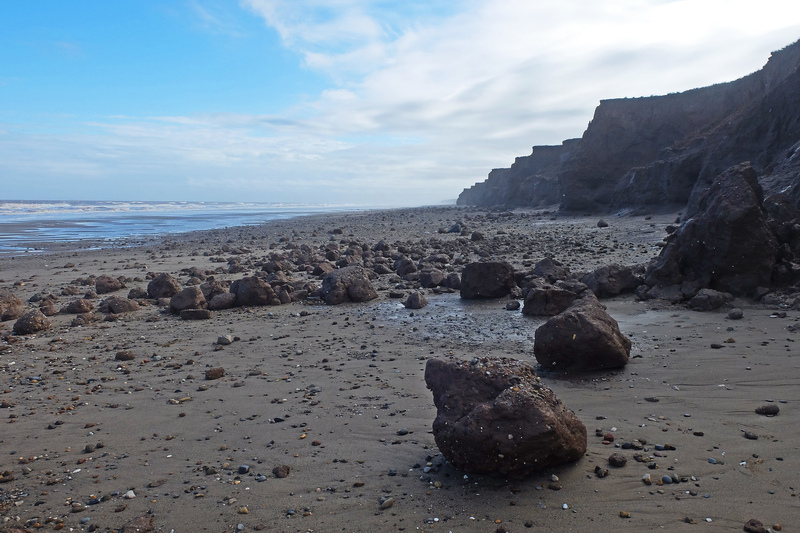 One fossil hunting man near Withernsea told me that the beach we were standing on was all sand yesterday. Now it was boulders, mudslides and shingle. He was happy sifting through the debris for newly exposed fossils, but I suspect the land owners up above the cliff were less so. After a brief walk along the short promenade at Withernsea my afternoon continued as the morning had finished and I was back on the beach all the way to Kilnsea and the North end of Spurn Head to meet a less wind-battered Kate. In doing so I passed on the seaward side of Holmpton and Easington with its huge high security gas terminal barely visible above the low cliffs. As I walked, the storm debris was tempting me into a bit of treasure hunting too and I spent much of the walk with my head down looking for fossils, pretty rocks and pebbles. The glacial deposited boulder clays and till are very soft and with the nature of such unconsolidated rocks come many erratics. These erratics give collectors a dream ticket to find a huge variety of fossils, rocks and minerals. I was a happy bunny as my rucksack slowly gained weight with various fossil fragments, pretty pebbles and a nice heavy handful of haematite. 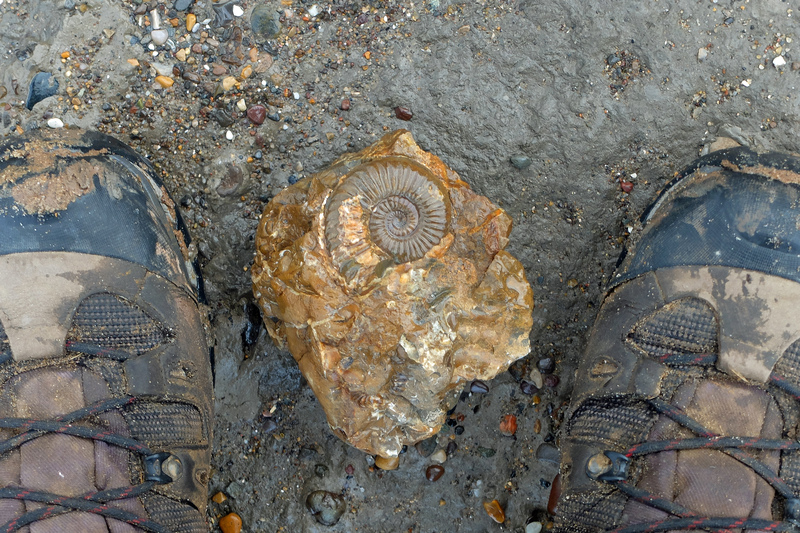 My day was complete when I found one very nice ammonite to take home. This entry was tagged ammonite, Beach, Bridlington, cliff, Coast, Filey, fossil, Great Britain, Hornsea, MS, MSNTC, SIA, Spinal Injuries, storm, Yorkshire. Bookmark the permalink. Pete, you are a giant of a man! My friends Flora and Ian, mentioned in this post, told me about your marathon endeavour. Good luck to the finish!